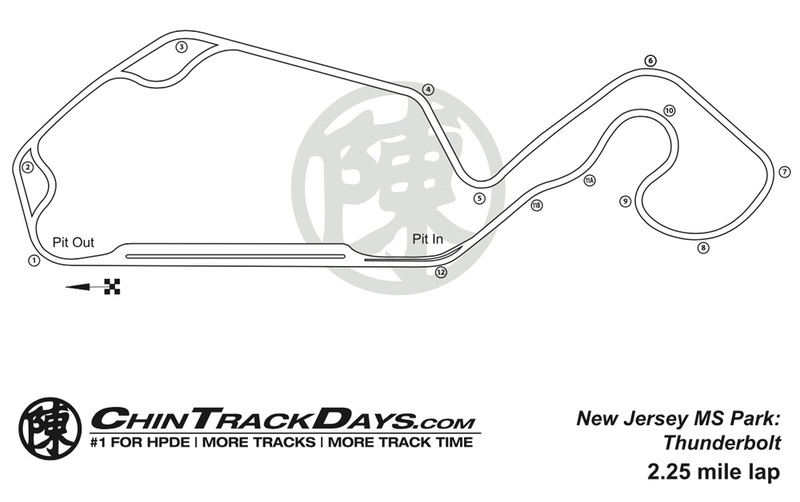 New Jersey, Thunderbolt: 14 turns, 2.25 mi. Register on this page for 1-day participation, Sunday. ONE-DAY registration is available for experienced drivers only, must be solo-qualified at NJMP. Sorry, novice driver registration is not available for one-day. GARAGES: rentals avail. directly from NJMP. click here for details. Chin Format: limited enrollment, over 3 hours daily track time to each group. For a full description of the format, click here. Meals at the track are on-your-own. Trackside concessions will be open for lunch. can be accepted, only in novice or intermediate categories. a bar or hoop must be fixed in place. A 2nd driver can be added to any primary registration for an additional $150/2-days. Like all drivers, a co-driver must have current membership in Chin Motorsports. Like most track time car clubs, Chin Track Days has an annual membership, required for all drivers.